It will be a November love for everyone, as Spring Films introduces a love story that will seek about true love. It will be a ‘kilig’ and funny movie as the romantic comedy film, “Relaks It’s Just Pag-ibig”, will hit on cinemas near you. Starring these generations new breed stars, Inigo Pascual, Sofia Andres, and Julian Estrada. It will be their debut on the big screen that will be showing on November 12, 2014. 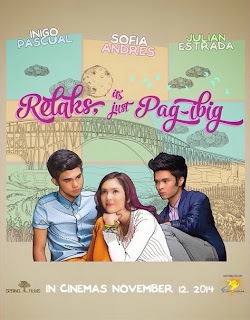 “Relaks It’s Just Pag-ibig” is directed by Irene Villamor and Antoinette Jadaone. The movie is distributed by Star Cinema. The romantic-comedy film is a love story that is seeking for true love. Introducing Sari ( Sofia Andres) who found a love letter that is from ages. The love letter is from a guy named Elias conveying of what he feels about his true love, Salome, and explained the magic of a blue moon. Sari bump into a boy of her age named Josh (Inigo Pascual). Josh is 16 y.o. boy who is young and crazy and is forced to join the journey of Sari, journey of witnessing what she had read on the letter. The two then found Kiko (Julian Estrada), Sari’s childhood friend. Kiko joined their journey with a purpose of protecting Sari and saying what he feels toward Sari while Josh on the other hand is falling for Sari and denies what he truly feels toward her. Little do they know, they are seeking of their true love while they are finding someone else’s. Catch the three on their journey of finding their true love and the magic of blue moon. Catch what happens next as they reached the end of their journey. The movie will hit in theaters nationwide on November 12, 2014.